Today marks the 9-year anniversary of the destruction of the World Trade Center towers in the September 11, 2001 attacks. 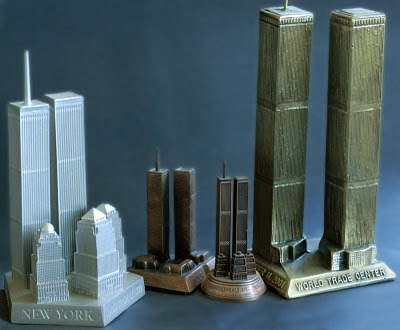 Over the years, many replicas of the Twin Towers have been produced both before and after the event which destroyed the structures. I recently found this extremely large metal replica of the WTC Towers. It seems to be a presentation piece and has a plaque which reads, "The Twin Towers Light. 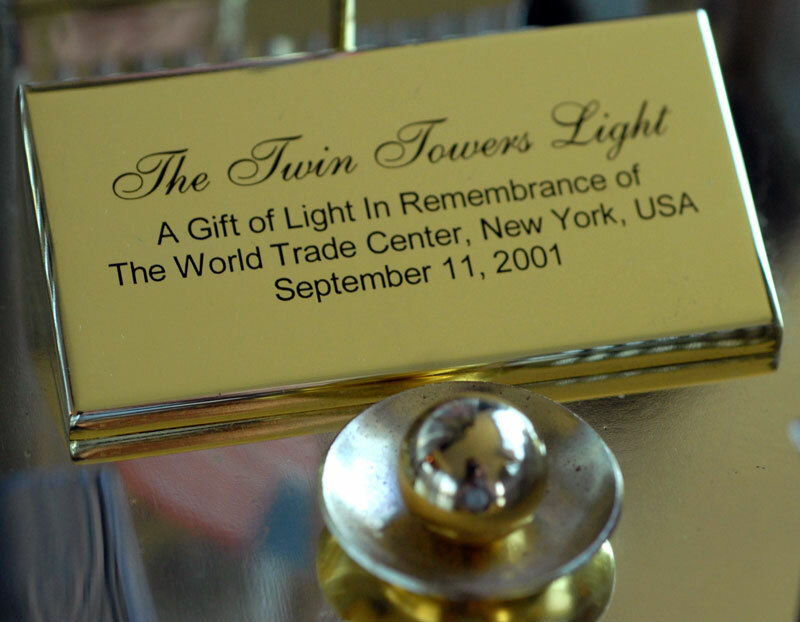 A gift of light in remembrance of the World Trade Center, New York, USA September 11, 2001." It also commemorates the other events that day as the base is in the 5-sided shape of the Pentagon and another plaque has an outline of Pennsylvania and a Liberty Bell. The entire piece is very large and measures 15 inches tall and 18 inches wide. Sticker on bottom reads "Imena Azul LLC" but I've been unable to find info about this company. Its electrified and two lights stand inside the two towers. Four other buildings are also depicted in the miniature which made up the World Trade Center. Another large replica is now being auctioned on eBay. 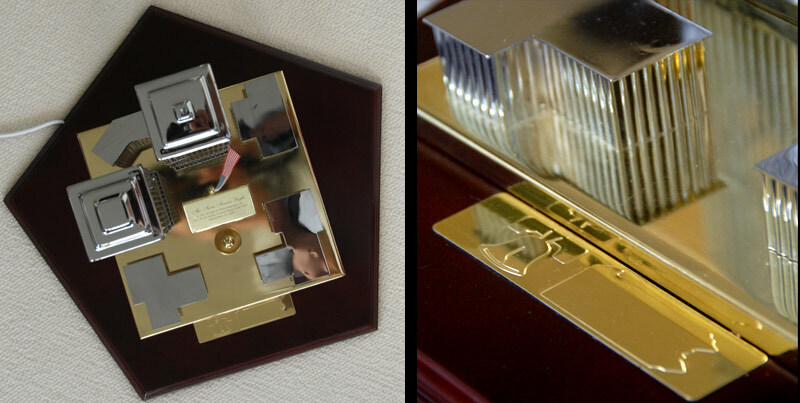 This one claims to be a one-of-a-kind architectural model of the WTC. It measures 12" X 16" X 28" and is made of plexiglass and basswood. The buy-it-now price is a whopping $2,987. Many other replicas have been made in various materials and sizes. I've written before about a WTC replica made of gold and diamonds and another replica cut from recovered Ground Zero steel. Thank you for writing about my first ever design work inspired by the Twin Towers and the events of 9/11. Indeed, the replica was a representation piece and was used during our Gift of Light and Songs project honoring victims and heroes of 9/11. It was first presented to Pentagon heroes in Arlington County along with songs I personally wrote. May I know where you found it?